Taxes are in the news these days. Throughout the presidential election, and subsequently during the fiscal-cliff debate, we held a grand national debate on taxation. Should we tax more? Or not? Is taxing damaging to our economy, or not? Will new taxes actually increase revenue and reduce our deficit, or not? Brown argues that the final fall of Rome took place not so much because of the brutal invasion of the barbarians, though there was that too. Rome fell, he believes, from within. And interestingly, taxation became one of the striking components of decline. As the barbarians, for example, conquered large swaths of North Africa, the primary food source for all of Rome, wealthy families began to fall too. So many people found themselves in desperate circumstances. The wealthy became poor. As the economy continued to squeeze the standard of living of the Roman citizen, the resistance to taxes became fierce. There came a point where people simply could not afford more taxes. There came a point where people began to question what it was exactly they were getting from the Roman government. People actually bailed out from the empire and joined their barbarian overlords. When this fundamental questioning of taxation and culture took hold, actually when the populace finally could pay no more taxes without themselves collapsing financially, the game was over. 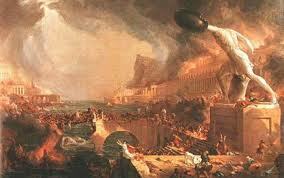 Rome began to disintegrate. Enter then the Christian Church. It was just as this moment that the Christian Church discovered its highest calling: to protect and serve the poor and to provide a stabilizing influence on the culture. At the same time as the old wealth, the landed wealth, lost their grand estates, the church was the recipient of enormous influx of wealth. With a more clear mission to serve the people, and with more wealth than they had ever known, the power of the Church replaced the power of the empire. We entered at this moment in the late fifth and early sixth centuries A D a new world, the world of emerging medieval Christian Europe.The Church, in this moment of enormous cultural disruption, disarray, and disintegration, became the stabilizing rock on which European civilization was eventually built. Perhaps we have something to learn about taxing people more when they are down and scared and desperate. Perhaps there is something to learn about hitting the limits of taxation. Perhaps we have something to learn about a revitalized Church that sees its mission to protect the poor and provide opportunity, meaning, and purpose for all people. When cultural demise and economic decline are at its height, that’s when the Church must rise to serve its highest calling. I know we can overwork this comparison to the fall of Rome and our own day, but if you are up for a very big and very stimulating read, I highly recommend Peter Brown’s great book. What does a retired president of SPU do? I’m delighted that you found one answer. I’ll be interested in reading your blog. I am presently reading A Free People’s Suicide by Os Guinness. He also makes a comparison between Rome and America, and his case is compelling. He does not, in the first half of the book, bring taxes into the analysis. I find it difficult to accept the extension of your argument, however, that those making more than $400,000 could be considered poor and overburdened by more taxes.